With a husband who is part Irish, St. Patrick’s Day is a much bigger deal now than it was when I was growing up. We’ve hosted a number of St. Patrick’s Day parties before but I am really excited about what I have in store for this year’s event. 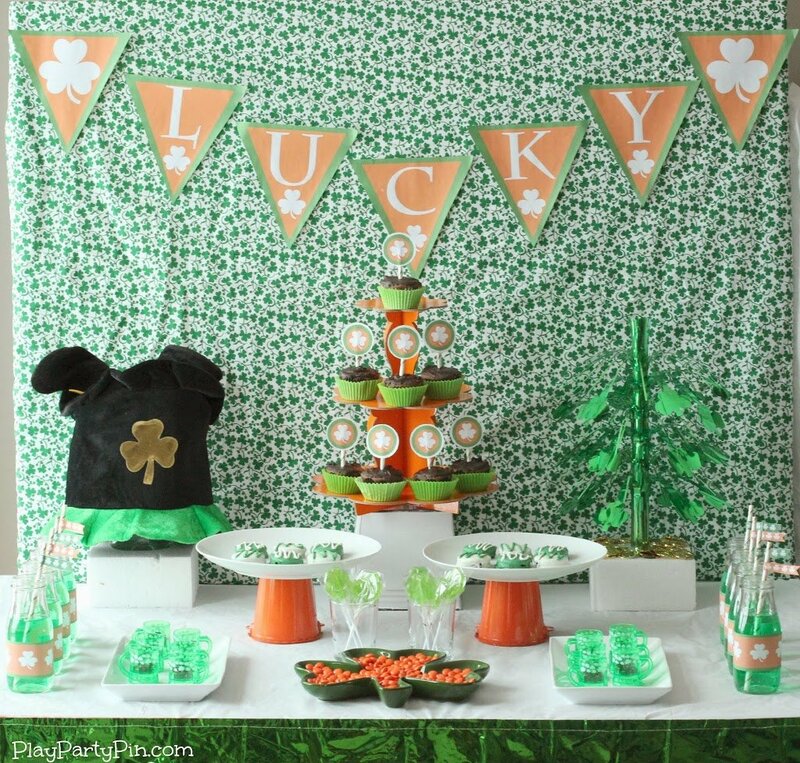 Delicious dessert ideas, festive decorations, and of course, awesome St. Patrick’s Day party games. I love to plan and style parties based on one inspiration piece and for this party, I was inspired by this awesome table skirt from Oriental Trading Company. 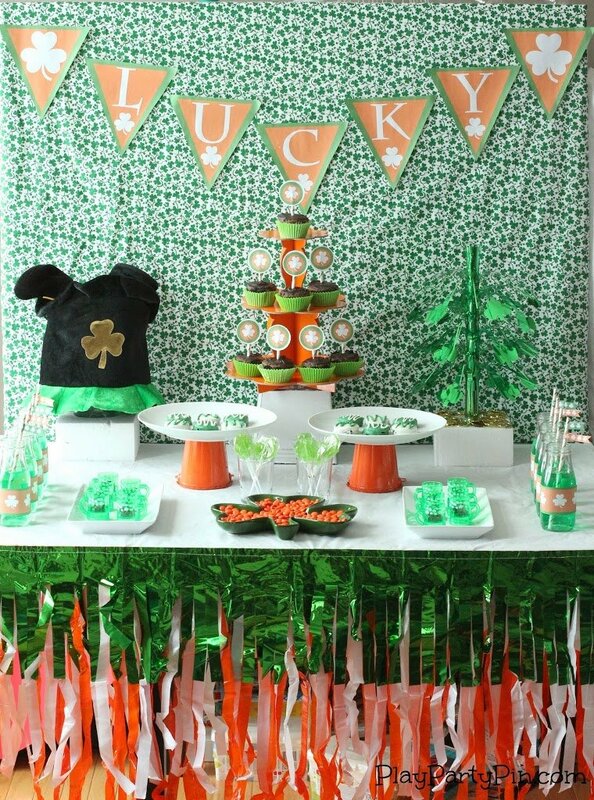 Based on the table skirt, I decided to forego rainbows and stick with the colors of the Irish flag – green, orange, and white. Using those colors, some great decorations from Oriental Trading Company, and my free printables made it a simple party to throw together. I decided to go with desserts only since I know people will be in and out of the party and I don’t want to deal with keeping food warm. I kept it simple and just made chocolate covered Oreos (using this tutorial) and chocolate velvet cupcakes. And of course, drinks with my favorite striped straws. To add a little color to my table, I added orange Reese’s Pieces throughout. 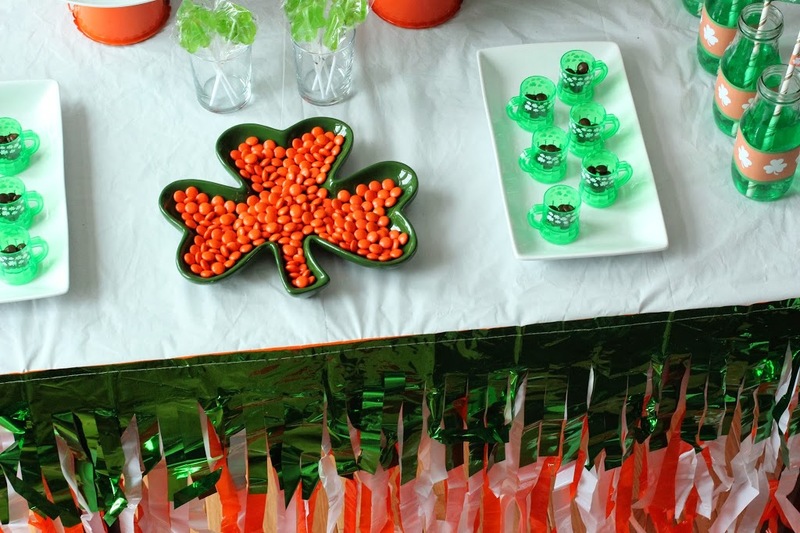 Always having colored candy on hand is a great tip I learned from this amazing party blogger and the orange Reese’s Pieces worked great for this party. Before we get to the games, here are the free printables that I promised. I’ve created everything that you’ll need for a party – circles that can be used for all sorts of things, water bottle labels, flags, and a banner. 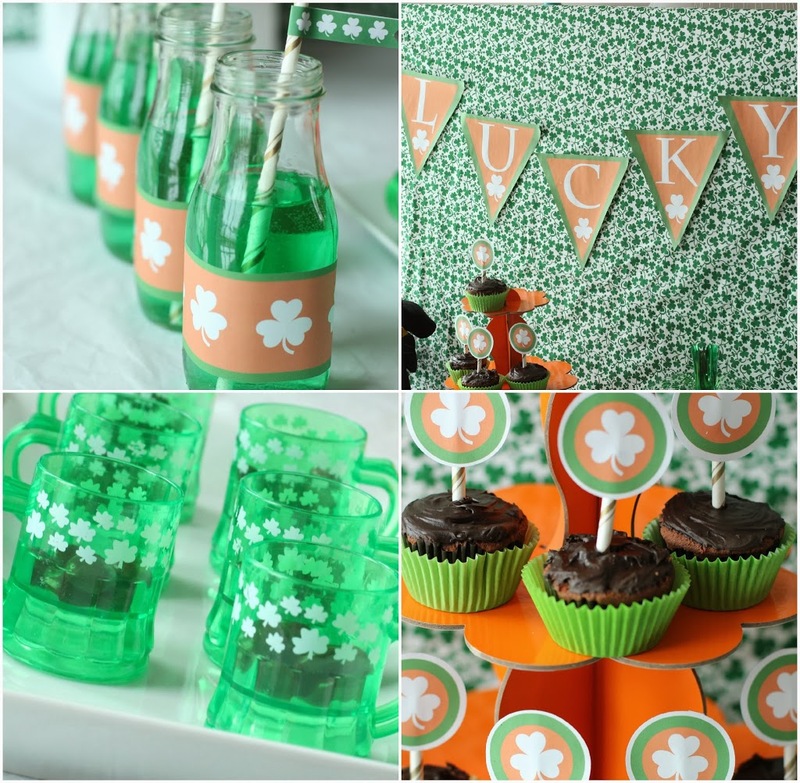 And last but not least, I planned three fun St. Patrick’s Day party games to keep my guests entertained all night. I’ve included all of the instructions and free printables you need to play below. 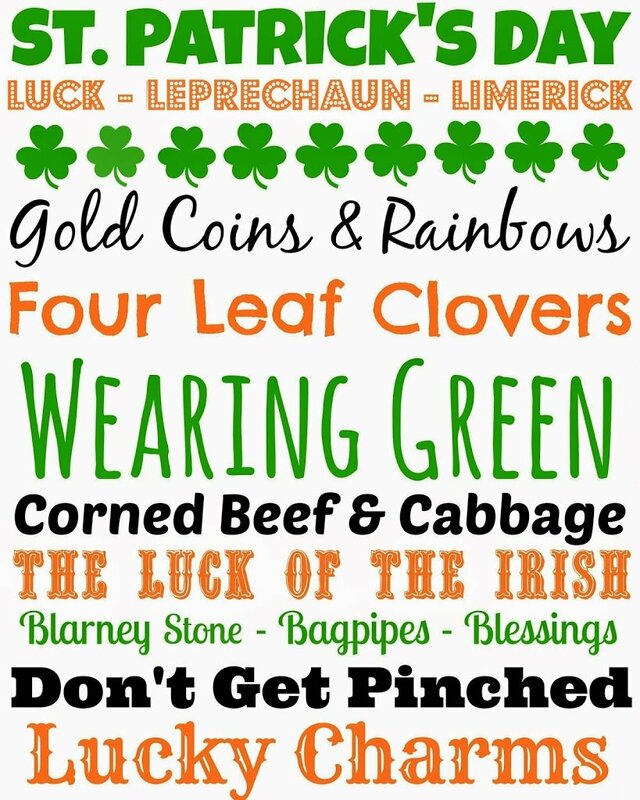 Print out a couple of copies of the printable list of St. Patrick’s Day words and place in visible areas around your party area. Place a bowl near your front door where your guests will definitely see it with the buttons inside and instructions next to it. You may also want to put one of the printable list of words next to the bowl as well. When guests arrive, ask them to take a button and wear it for the duration of the party (or until it gets stolen). Continue the game until a set time (I recommended an hour before the party ends) or until one person has collected all of the buttons. Whoever has the most (or all) buttons at the end of the game, wins a prize. This game will be played in numerous rounds and each round is simple. You can either have guests sit/stand in a circle or you can just play this while people are mingling with other guests (I prefer the latter). Before you start playing, tell guests that they are going to try and avoid the shamrock short stick. 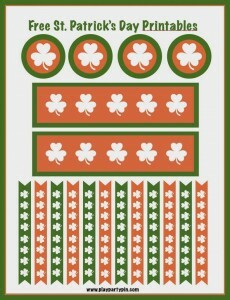 During the first round, all shamrock sticks should be the same length except one that has been cut short. Hold all of the sticks in your hand so they appear the same length (and keep the actual sticks hidden in your hand). Walk around the party and ask guests to pick a stick from your hands. The person who gets the short stick is out. Collect all of the sticks from guests and remove one regular length stick from the group of sticks (since someone is out). Cut another short stick and continue with round 2, this time two people will be out because there are two short sticks. Continue removing sticks (when people get out) and cutting an additional short stick for each round. The winner is the person who never pulls a short stick. Six plastic cups for every two guests that will be playing, numbered 1-6 or a tray like this one. Setup game areas throughout your party area with one die, six numbered plastic cups, and plenty of chips for the game. You will need one game play area setup for each two guests that will be playing. So if you have 10 players, you’ll need five game play areas. Make sure to include a number at each game play area so people know where to rotate. Break your group into pairs and have each pair select a game play area to start at. Ask each group to put one chip in cup 1, two chips in cup 2, and so on up through cup 6. Explain to guests that they will be taking turns rolling the die. When they roll the die, they will be able to take the chips from the cup that matches the number they rolled. So for example, if they rolled a 6, they would take the six chips from cup six. The catch is that if they roll a number that the other person has already rolled, they have to give the other person all of their chips and that round is over. If the pair successfully rolls all six numbers without repeating numbers and empties all of the cups, they refill the cups and start again until someone rolls a repeat number and hands over their chips. Any chips in the cups that have not yet been collected when a repeat number is rolled (and round ends) remain in the cup for the next pair. Once each group has finished their round, play stops and players move to the next play area – losers move up one number and winners will stay at the table they are at. Once everyone has moved, tell them to ADD the corresponding number of chips to each of their cups (so if the previous group did not collect chips from cup three the previous round, there might be six coins – 3 + 3 – in the cup for the second group). After the cups have been updated with chips, that round’s play begins. Continue playing for 10 (or a set number) rounds. Player with the most chips at the end of all of the rounds is the winner. Printables, styling, and photos – Britni from Play. Party. Pin. My husband is mostly Irish and we enjoy our yearly corned beef and cabbage. 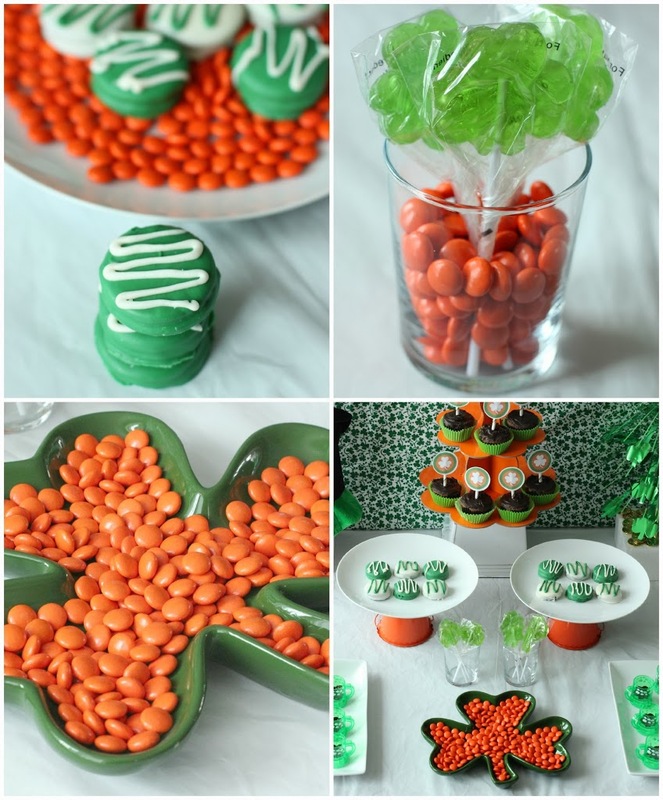 Love anything green though- super cute ideas! Pinned! G’day WHAT GREAT idea Britni! 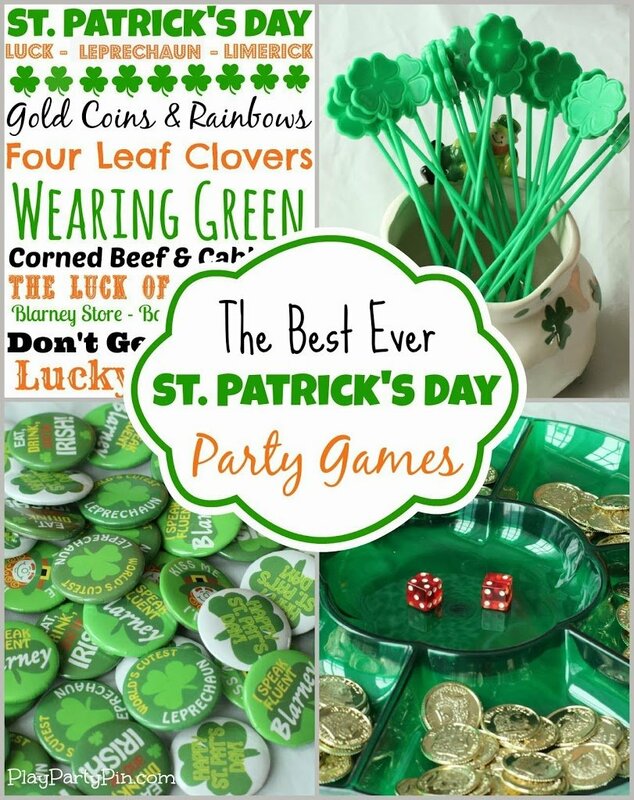 Loved all of the St Patrick’s Day ideas and the printables too! I hope you will consider adding your link to today’s Foodie Friends Friday St Patrick’s Day GREEN Recipes Party! Thanks Marissa, we had a lot of fun with this one! Fun game ideas. I have no plans for a party, but my kids would love to do these! Just pinned it so I can come back to it later this week! Thanks! 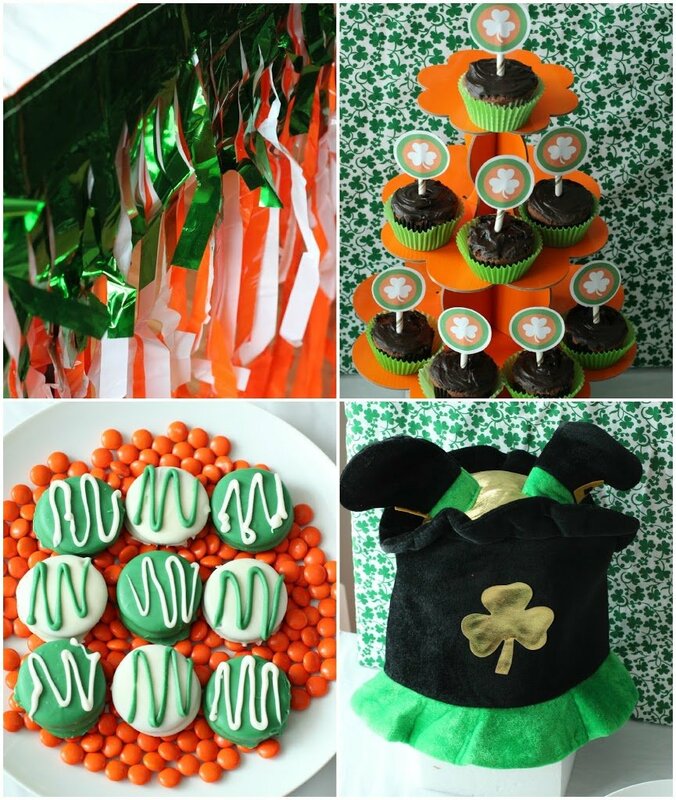 I love all these great St. Patrick Party ideas! 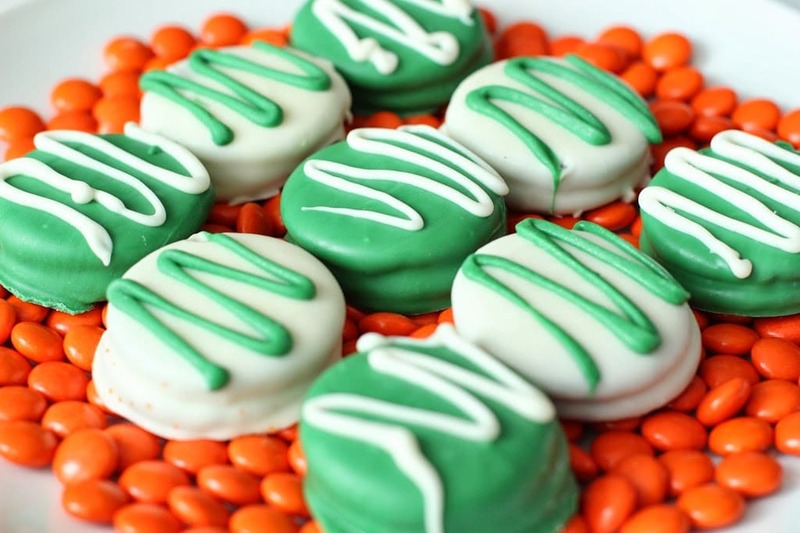 Those chocolate covered Oreos look cute in green! All the decorations and game ideas are so useful. I’ll know where to stop by if I need party ideas! It was great to see you at the Pure Blog Love Linky Party! We can’t wait to see what you’re bringing this week! The party starts Thurs at 8 p.m. EST. and runs all week end. I’m hosting at http://www.homemadefoodjunkie.com. Have a great week!